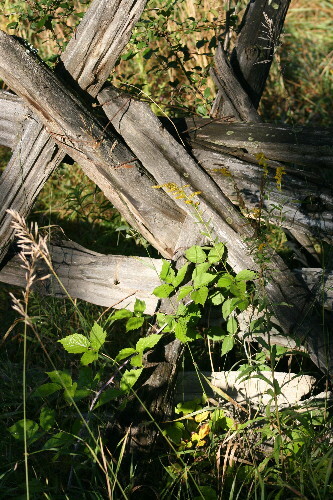 It can be hard to get out of a habit once you’ve become established in it. Blackburnian, ever the biologist, a couple weeks ago set up a semi-formal survey route along the road from our house to the meadow of this post. He’s not content to just simply bird – he likes to track things, record his data and be able to look back on it to compare. This was quite suitably fulfilled through the daily surveys that are part of the regular operations of a migration monitoring station, which he’s been a part of for many years. Prior to getting into that, though, he maintained a route at his parents’, and now, has established one here. Even back then, there was this fabulous site called eBird. Today it’s grown and exists in several incarnations, our Canadian version being eBird.ca, the Americans still using eBird.com. Effectively a citizen science project, eBird encourages birders to keep track of what they’re seeing on their outings and submit the observations to the site. With the addition of location and some effort data such as date, timespan, number of observers, area covered, etc, the information can be a valuable snapshot of what’s being seen where, when. When pooled together, the data form a bigger picture of trends at a larger scale. Needless to say, rather than languishing in a notebook on a shelf, all our data is being submitted to eBird. The site also has tools for users that summarize your observations for you so you don’t have to do it by hand on your computer, or by flipping through notebooks, pretty handy. It’s also good motivation to get up early and go out birding. Yesterday I did “census”, following the prescribed 1 kilometer route for the prescribed 1 hour window. It’s interesting to note what you see, and how it changes from day to day. Blackburnian had done the survey the day before, and even from one day to the next our observations varied considerably. Most notably, he had a Sora, which he flushed from the edge of the little marshy bit when he stepped off the road to avoid a car; I did not. On the other hand, I had a trio of Brown Thrashers, including this one, who sat on the branch for a minute or two preening his breast feathers; he did not. That Sora, and these thrashers, were probably long gone today, continuing on with their long journey. 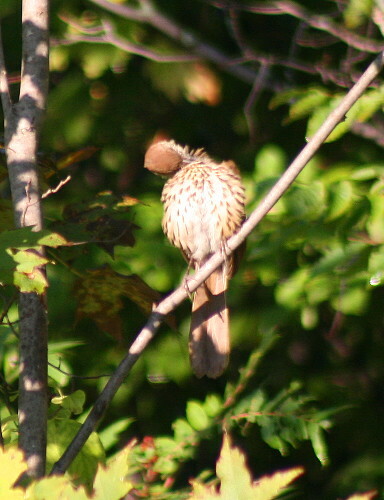 For all I know that same Brown Thrasher could be roosting in a hedgerow in Pennsylvania right now. Another difference between the two days was in the number of Scarlet Tanagers. A breeder in deciduous woodlands, I have no doubt that these birds will be exceedingly common come next spring, but now that everyone’s dispersed, moving around, and even starting to move out, happening upon them can be hit or miss. Blackburnian missed, but I hit. I tallied ten during my walk, most of which were all in the same flock (the same flock that contained the thrashers; that flock was hoppin’). This particular tanager is a male. Young-of-the-year males start off with the same yellow plumage as the females, while older males lose their red in the fall to become yellow. How can I tell it’s a male, then? Males always still have their black wings; females have brownish wings. I saw one male in the flock that was mottled red and yellow, halfway through his fall moult, but the rest of the birds were straight yellow. 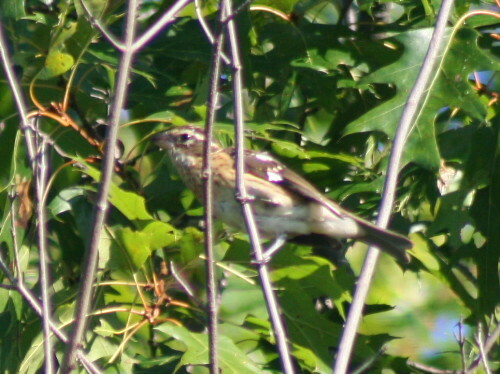 The Rose-breasted Grosbeak is another species where the males lose their gaudy plumage in the fall, opting for the more cryptic streaky browns of the female. So far this fall I’ve more often heard than seen them. Although they’re no longer singing, the Rose-breasteds, and their cousins the Black-headed Grosbeaks of the west, have very distinctive call notes that always remind me of the squeak of a rubber-soled shoe on a gymnasium floor. Really, you can’t mistake that for anything else, so you don’t necessarily need to see them. I was lucky to see this guy, though. And yes, I know it’s male, despite its brown plumage. Male grosbeaks have pink “underarms”, while those of the female are yellow or, occasionally, salmon. When this one flew off, his were pink. 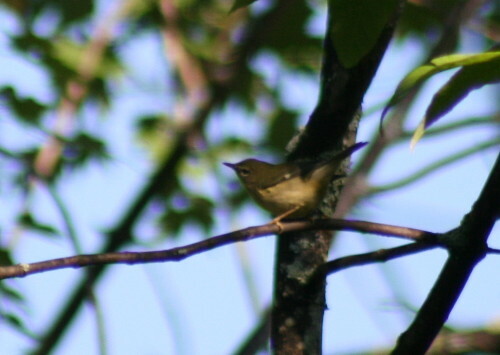 This one’s a female Black-throated Blue Warbler. As with the tanagers, the “Blues”, as I call them, are dramatically sexually dimorphic, with the male and female having substantially different plumages. 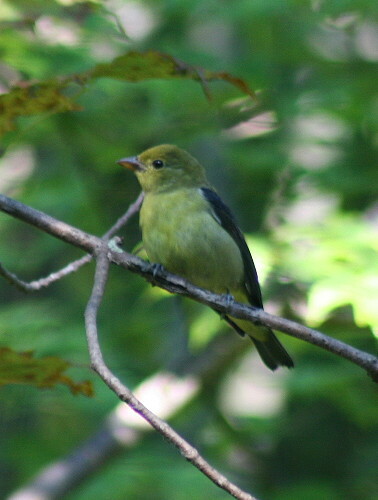 This female has neither a black throat nor is blue, characteristics of the male. When the species was first discovered and described, they were actually thought to belong to two different species because of their total lack of resemblence to one another. 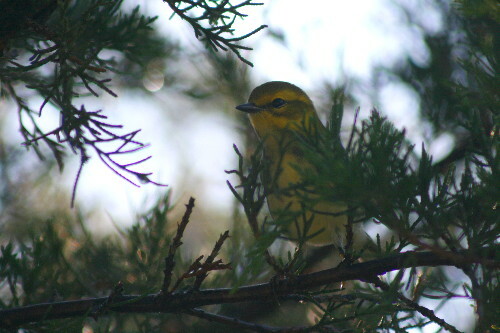 However, there is one characteristic they both share, and that’s the little patch of white you see on her wing – no other species of warbler has that. 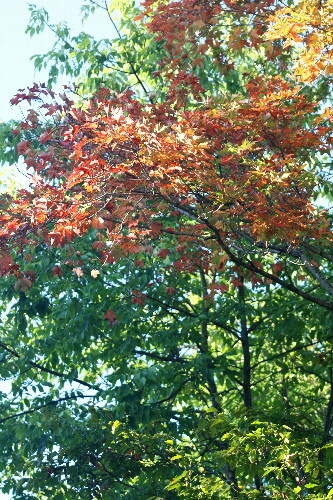 The photo’s not the greatest, as she was some distance away in the shade of the photo, but the white spot is diagnostic. Unrelated, though sharing a similar name, the Black-throated Green Warblers, or “Greens”, also unsurprisingly share the same feature of a black throat in males. Females lack this characteristic, and during the breeding season, a Green with a pale throat is undoubtedly a female. However, in the fall it’s possible for either young males or females to have pale throats. The throats of males are usually whiter with a couple of black feathers thrown in, but it’s not foolproof. I think this is a female, but it’s really hard to say for sure. Greens, despite their name, are not really green, certainly not hummingbird-green or parrot-green. Their name reflects the dingy yellow – nearly olive – of their back relative to the bright yellow of their facial markings. This one checks me out. I’ll often crop out extraneous bits of a photo, but this one I left full-frame. I was pishing to draw the birds out of a rather thick juniper bush, and this Green flew right in to about five or six feet away, which allowed me some great photo opportunities. Too bad the sun was behind her! 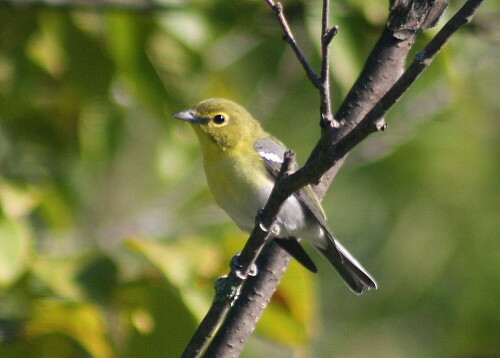 We’re finding warblers and vireos to be in generally lower abundance than we would find at a site along Lake Ontario, for instance. I did have a passable number of species yesterday (seven warbler species, which is more than we’ve seen most days), but at a lakeshore site you’d probably easily get double that, if not more. I haven’t had too many of these, Yellow-throated Vireos, most days we went out, but yesterday I was lucky and had four or five. Interestingly, this species, though it breeds throughout southern Ontario, is one that I hadn’t seen prior to moving here (though I’d heard them singing before, such as the summer I worked in Ohio). Now, they seem abundant, likely another that will be encountered frequently through our woods in the summer. This one came in with the Green to check out my pishing and posed rather obligingly for the camera. I’m really enjoying the birding here, so many neat things to turn up, but we are really finding that it’s necessary to head out along the road to find much. We’ve got a nice patch of land, but it’s all mostly treed, and during the fall migration all the breeders have moved out of the woods and into more scrubby areas such as old fields, roadsides and hedgerows. We’ll look forward to the spring, when birds start moving back in and setting up shop. We’ll be excited to find out just what calls our place home, but in the meantime, a walk down the road gives us a taste of what we might expect.